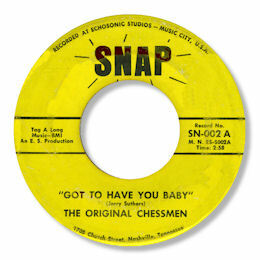 There were several varieties of Chessmen in the R & B, Doo Wop and Soul worlds but I've no idea which, if any, of them became these Original Chessmen. Sadly this very rare 45 certainly didn't put them back on the map but it gets its mention on these pages on merit. Got To Have You Baby is a deep soul ballad in the classic 12/8 mould, full of good things like the organ fills and the tastefully subdued horn charts. The lead singer is suitably desperate - nice falsetto touches too. The Snap label came from Nashville. Note - I've been in touch with Tommy VanAtta of Tommy & The Chessmen and this group isn't his.